The weather outside is frightful, but the fire is so delightful! At least I hope the fire is delightful—the fire in this case being a burning furniture factory—because that’s the only way my poor citizens are going to stay warm since the power has gone out in the entire city. It’s not the snow causing the problem, mind you, it’s the cold. In Snowfall, the new expansion for Cities: Skylines, snow may slow down traffic on unplowed streets, but cold is the real killer. When the temperature drops, your chilly citizens crank up the heat in their high rises and townhouses, sucking the juice from your overworked power plants. Back in September, the After Dark expansion added the tourism specialization and changes to day and nighttime traffic, yet I never felt much of an impact on how I played. 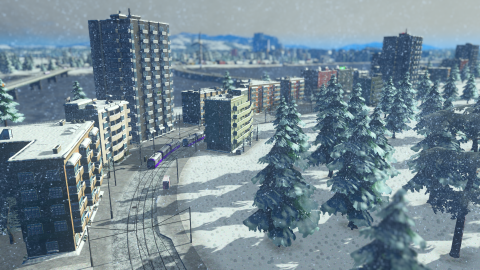 Snowfall, on the other hand, almost immediately affects how I build, grow, and manage my city. For the first time since I deleted a hydroelectric dam and watched in horror as an entire residential zone was flooded in sixty feet of water, I was in a panic. Half the city was sucking up the juice to heat their homes, the other half were freezing, and my power plants were low on oil due to trucks being unable to reach them, thanks to my unsolved traffic problems. I enjoy Skylines immensely, but it’s never felt like much of a challenge. Now, when it comes to power management on winter maps, it does feel considerably trickier. You have a few different ways to keep your city warm. There’s a new policy available that requires buildings to use more insulation, though construction and maintenance will cost a bit more and it won’t solve the problem when the temperature really plummets. You can stick with electric heat, though you’re going to need reliable routes to truck in coal and oil if that's what they use (and I shudder to think about solar-only cities when night falls and the temperature bottoms out). There are also new new buildings: boiler plants (which require oil) and eco-friendly geothermal plants, both which use upgraded piping to deliver heat directly to your residents. If you want to use the new piping throughout your city, it becomes available when you reach ‘Boomtown’ status (2,400 residents) and you can manually overwrite any standard water pipes you’ve already got in place. Be prepared to pay through the nose for it, though: upgraded piping costs five times as much as regular water pipes and twice as much in upkeep. This slows down the early hours of building a city, but in a good way: I now find myself drawing water lines more conservatively in case I need to upgrade them later, I leave more room for future power plants, and I generally put more thought into the layout of my new cities. This new temperature feature is added to all your cities and maps, though will be far more drastic in the winter-themed maps where the temperatures really dip. Less of a big deal is the actual snow. It’s certainly pretty, and it’ll cover your roads and slow traffic even more than than the line of donut trucks you’ve got inching their way through town. It’s not much of a hindrance, though, and adding a few ‘snow dump’ buildings produces a fleet of snowplows that race around clearing roads for you. It’s a bummer that snow only occurs on winter-themed maps, and that winter-themed maps are eternally winter, though. I would have much preferred a true, yearly seasonal cycle that could be applied to all the maps. Modders: I’ll give you two weeks to make that happen. There are lots of new winter-themed parks and buildings available: hockey rinks and stadiums, ski resorts and winter-themed hotels, and a new health building, the sauna, which citizens seem excited about sitting in next to their naked and sweaty neighbors. The best addition are the trams, long desired by fans. Plop down a tram building, upgrade roads in your city with ones that have electrical cables running over them, then plan your routes just as you do for your bus lines. (I didn't know why people wanted trams so badly, but now that I have them, I completely love them.) Even if you don’t buy the expansion, you get some free stuff with the update, like rain and fog, UI improvements, the temperature system, and number of tweaks and fixes. Also, Chirpy, that bird we all hate, has been given a Santa hat. The full list of what’s in the expansion and what you get for free is here. With Snowfall, Skylines is beginning to feel a touch closer the complex simulation many have wanted. I wouldn’t say it’s a complete game-changer, but it does add a few more frosty layers to your management challenges and options when it comes to power, and it makes having smooth traffic even more important for resource deliveries. Plus, there’s something about a city at night, blanketed in snow, that warms the heart. Even if your citizens are freezing.